Dehlia de Jong has quite the results if you look at the ladies events she has played in the past. 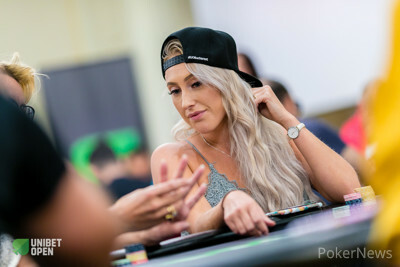 Last year she finished runner-up in the ladies event here in Bucharest at the Unibet Open behind Carmen Zainescu and earlier this year she got second in Malta behind Ann-Roos Callens. De Jong already had Callens on her direct right to relive her second-place finish, but now Zainescu joined the table on Callens’ direct right. Daiva Byrne is also seated at the same table so the ladies have a nice warm-up tournament before their #QUEENRULES event tomorrow.